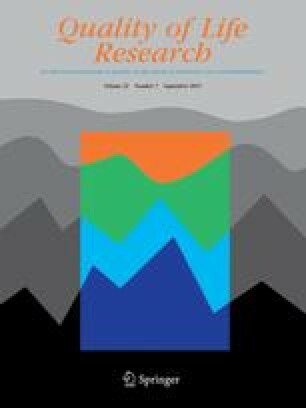 The purpose of this paper is to compare three approaches to the measurement of patient-reported health status which produce summary scales of health status: the Patient-generated Index (PGI) is a measure of individual quality of life (QoL), the EuroQol is a measure of QoL the results of which are weighted by utility values gained from community surveys and the SF-36 which produces two summary scales of health status (the physical component summary (PCS) and the mental component summary (MCS) scores). A follow-up interview survey of patients with obstructive sleep apnoea (OSA) was conducted. The patients received continuous positive airways pressure therapy (CPAP) between the two administrations of the questionnaires. One hundred patients presenting with OSA and who were suitable for CPAP therapy were asked if they would take part in the study. The results on the PGI, EuroQol EQ-5D utility weighted scores and ‘thermometer’ scores and SF-36 physical and mental summary scores were measured. Eighty-nine respondents provided sufficient data to calculate PGI and EuroQol scores and 86 patients provided sufficient data to calculate SF-36 summary scores. The PGI indicated substantial improvement after CPAP treatment whereas the EuroQol indicated little or no improvement on either utility weighted or thermometer scores. The SF-36 PCS and MCS scores were lower than those of the general population at baseline, but had improved to the normative levels after treatment. The EuroQol provided a substantially different picture of change to either of the ones gained from the SF-36 or PGI. It is suggested that the EuroQol does not contain questions which relate to important aspects of health and well-being and may not accurately reflect the health state of individuals. Consequently, caution must be exercised to assure that an appropriate instrument has been employed when using health outcomes data to assess or prioritize available health care treatments. Health status apnoea Patient Generated Index SF-36 EuroQol.